The fog has been rolling in this week in great white sheets, rolling over the hills. My neighborhood has such a tangible relationship with fog. We embrace each other, work into the depths of each other. Fog swirls around our streets and wisps through the corner of our chain link fences. Sunlight fights the buildings to reclaim its hill top territory, and the fog races through the terraces, desperate to flee. Forest Knolls, Crestmont Street, Diamond Heights, Golden Gate Heights, we are the first thing the fog truly touches when it rolls in from the ocean. We provide the surfaces and the touch for mist to coalesce, dropping off the moisture gathered a thousand miles away. We are the islands where blue butterflies still roam, the sanctuaries for coyotes and the smell of eucalyptus dust, foxes and jasmine. And we are also the final resting place of San Franciscan latitude fog. The bright Noe, Castro, Mission owe these standing hills a debt of gratitude. We pay with our drenched sweaters and drenched in sweat climbing to our ear-popping homes to enjoy a view that fifty percent of the time is erased from sight by fog the color of a blank page, like an erased world, so that those bright districts can have shadows and open air cafes. We are the inhabitants of this cool piece of landscape. We visited Oregon recently for a few days… and it was really hot, into the 90s. 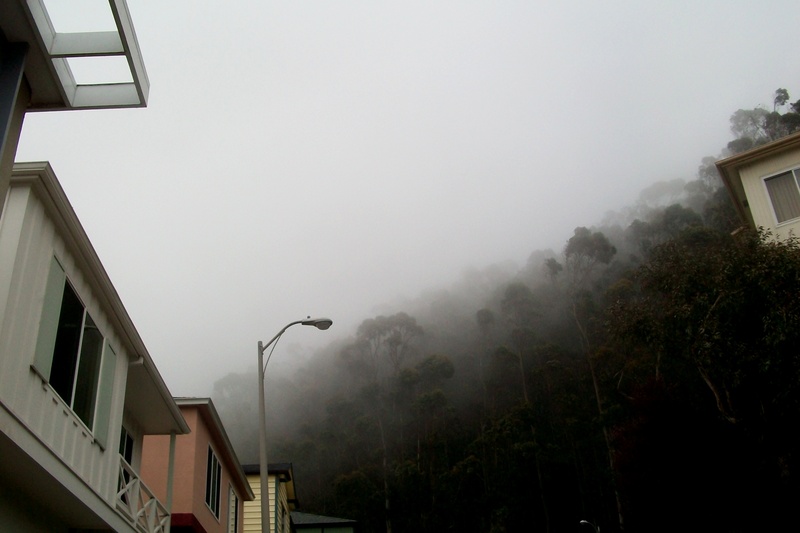 Coming back to the dense gray fog of Forest Knolls was such a relief!